Javier Rivera, Eduardo Rodriguez, Co-PI Manuel Jimenez, and Jesus Torrado and pose for a group photo after a successful test of the prototype Free Vehicle in Magueyes Island, La Parguera, PR. Image courtesy of Bill Schmidt. Download image (jpg, 69 KB). Although 12 people have walked on the Moon and numerous spacecraft are now exploring our solar system and beyond, very little is known about the oceanic trenches here on Earth. Exploration of these trenches is one of the last frontiers of oceanography and poses great technological challenges. Their general geographic remoteness and extreme bottom-pressures (greater than 8,800 pounds per square inch) have made all sampling techniques difficult. Cable lengths needed (greater than 6.5 kilometers) make tethered sampling cost-prohibitive and problematic in terms of successful data acquisition. Autonomous underwater vehicles (AUVs) and remotely operated vehicles (ROVs) are also costly and often require the use of large, expensive research vessels. 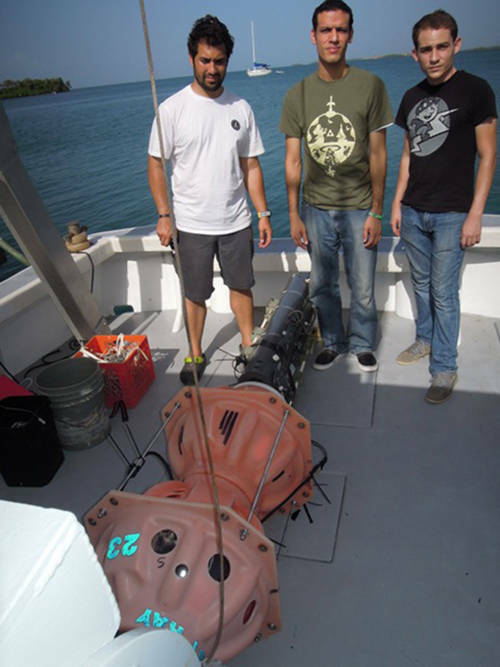 PI Bill Schmidt and UPRM DMS crew member David Ramos preparing prototype free vehicle control/buoyancy modules in Magueyes Island, La Parguera, Puerto Rico. Image courtesy of Co-PI Manuel Jimenez. Download image (jpg, 69 KB). 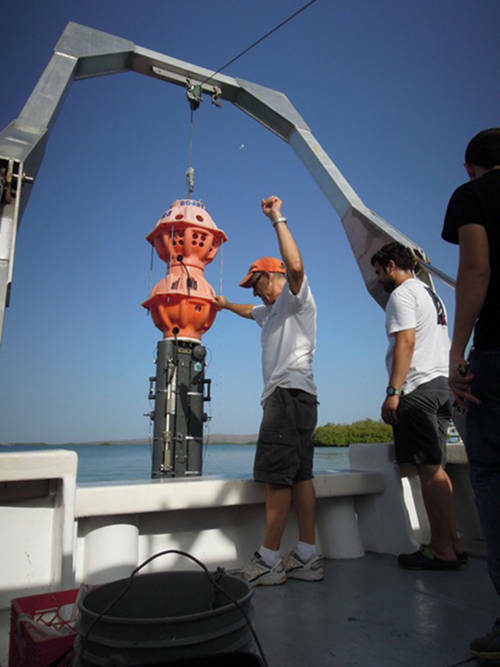 Bill Schmidt and undergraduate student Javier Rivera conduct a shallow water test deployment in Magueyes Island, La Parguera, PR. Image courtesy of Co-PI Manuel Jimenez. Download image (jpg, 66 KB). First developed in the 1930s, free vehicles are untethered ocean sensor packages that are deployed from ships and collect valuable information about the ocean environment in areas that are difficult for humans to access. These low-cost, untethered free vehicles can be thought of as the oceanographic analog to unmanned or small-satellite space missions. Until recently, the extreme pressure at the deepest parts of the ocean and limitations in buoyancy technology prevented free vehicle use in these areas. Recent developments in ceramics now make it possible to use small (43-centimeter) spheres for buoyancy at depths of 7,000 meters or more. 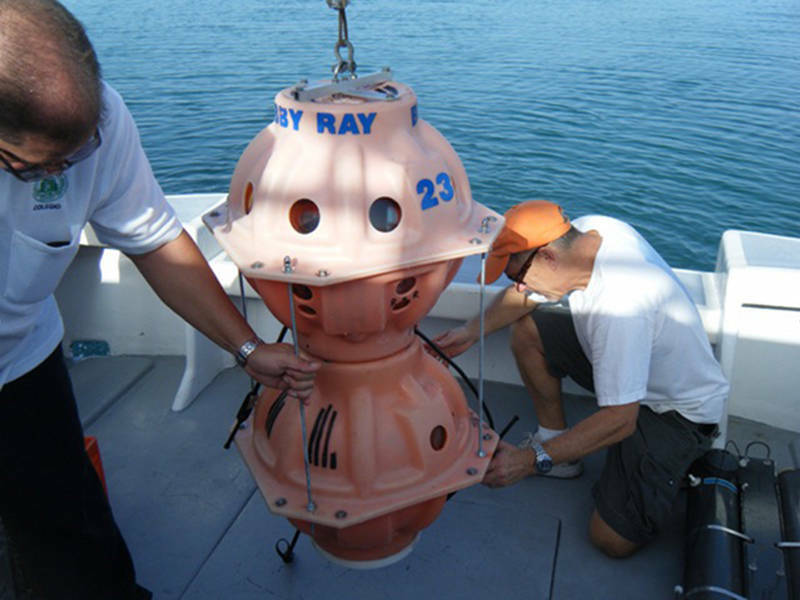 Using these buoyancy spheres, we have greatly reduced the size and cost of accessing the deep sea. 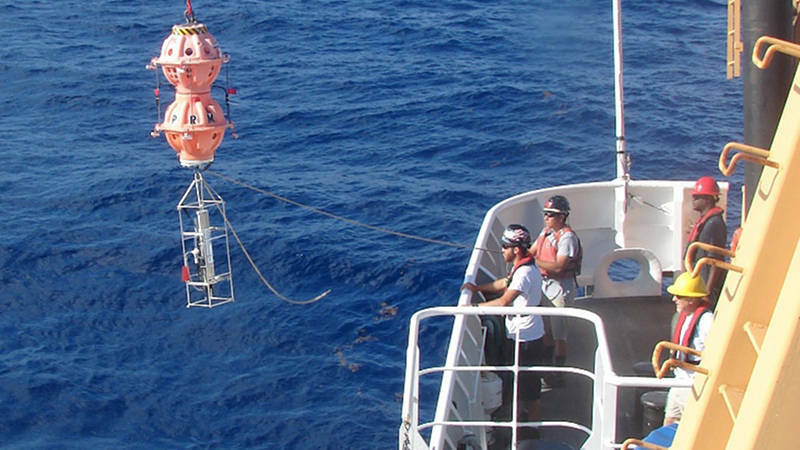 It is now possible to use off-the-shelf technology to reliably lift standard oceanographic equipment from hadal depths at a fraction of the cost of previous methods. Javier Rivera, Eduardo Rodriguez, Co-PI Manuel Jimenez, and Jesus Torrado and pose for a group photo after a successful test of the prototype free vehicle in Magueyes Island, La Parguera, Puerto Rico. Image courtesy of Co-PI Manuel Jimenez. Download image (jpg, 49 KB). 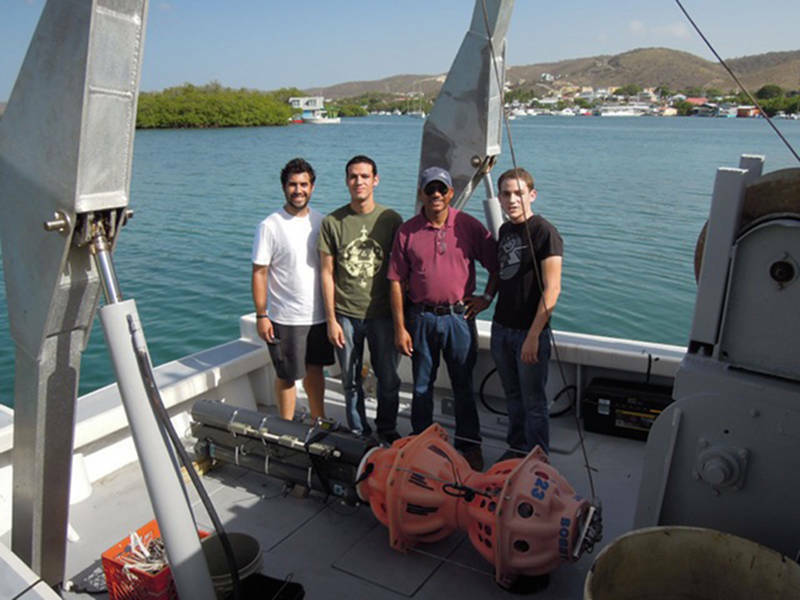 Our team at the University of Puerto Rico Mayaguez will leverage recent advances in the engineering of un-tethered free vehicles to deploy and retrieve Niskin bottles, digital camera, and an Acoustic Doppler Current Meter (ADCM) package in the largely unsampled abyssal (> 4,000 meters) waters south of Puerto Rico (Muertos Trough) and apply the advanced free vehicle technology in a multi-disciplinary survey of the hadal (> 6,000 meters) depths of the Puerto Rico Trench. We will systematically test, improve, and enhance the relatively low-cost free vehicles and free vehicle-supported research methods in shallow to abyssal depths, such as the Muertos Trough, and to employ the improved techniques in an exploratory study of Puerto Rico Trench hadal waters. The free vehicle is deployed from NOAA Ship Okeanos Explorer for its first 2,000-meter dive near the Puerto Rico Trench. Image courtesy of Co-PI Manuel Jimenez. Download larger version (jpg, 492 KB). Incorportaing invertebrate/sediment collection into the vehicle. 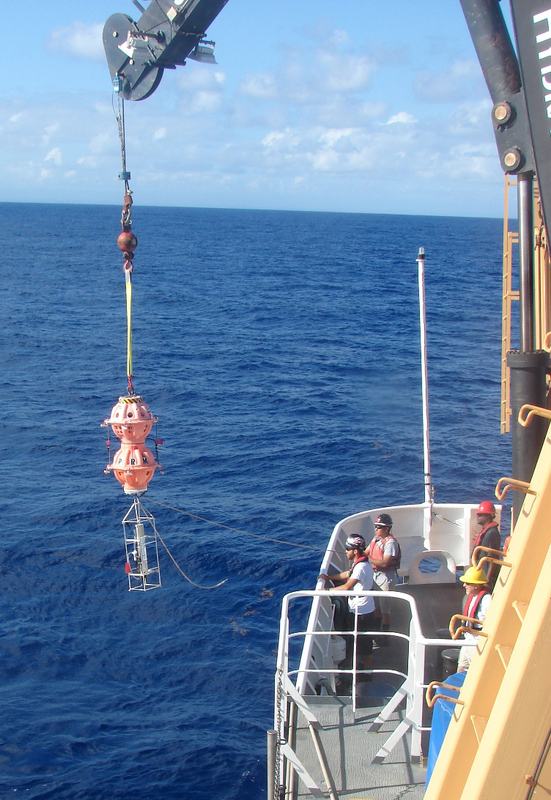 If successful, our free vehicles will collect some of the deepest CTD data ever collected in the Puerto Rico Trench and will provide critical information regarding the deep sea environment around Puerto Rico. 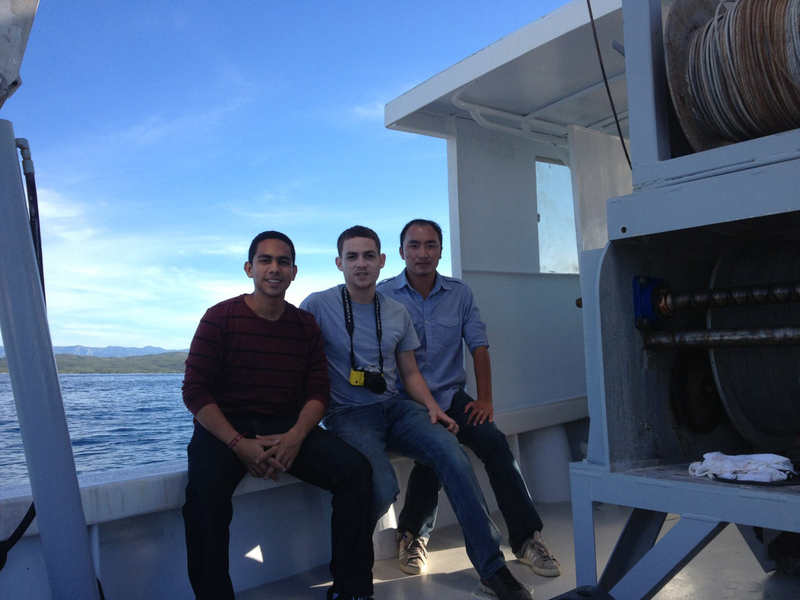 Danilo Rojas, Jesus Torrado, and Haibo Xu take a break while working onboard. Image courtesy of Co-PI Manuel Jimenez. Download larger version (jpg, 393 KB). The Puerto Rico Trench is unique in its geographical isolation/orientation and in its location between Atlantic deep/bottom water sources. Additionally, the Muertos Trough and Puerto Rico Trench are both thought to pose significant tsunami hazard to Puerto Rico and the U.S. Virgin Islands, the greater Caribbean, and the U.S. East Coast. Despite their logistic proximity, Muertos Trough and Puerto Rico Trench abyssal and hadal water column, biota, and sediments are largely unsampled. Video courtesy of the NOAA Office of Ocean Exploration and Research, Muertos Trough and Puerto Rico Trench 2015. Download (mp4, 99.5 MB).